"I like to mix old and new things, different ages" The design enthusiasm of the legendary supermodel Kate Moss extends far beyond her personal wardrobe. This proves her exquisite home in London. As Architectural Digest writes, for almost three decades before the camera lens, Moss became known for her iconic ability to combine clothes. Her sense of interior design is just as innate. And it's also eclectic: "I like to mix old and new things, different epochs." Moss collaborates with interior designer Katie Grove, her former assistant in the design of her homes. "I do not want to say that I'm the controlling freak, but I'm the controlling freak," Moss jokes. Supermodel is not at all a "lark", it is known to many. Therefore it is easy to explain the fact that the bathroom in her London home is inspired by the twilight. "This is my favorite time of the day," says Kate who is "night owl." - A picture of a summer night, when everything is illuminated by a silver-blue moonlight from the light. " 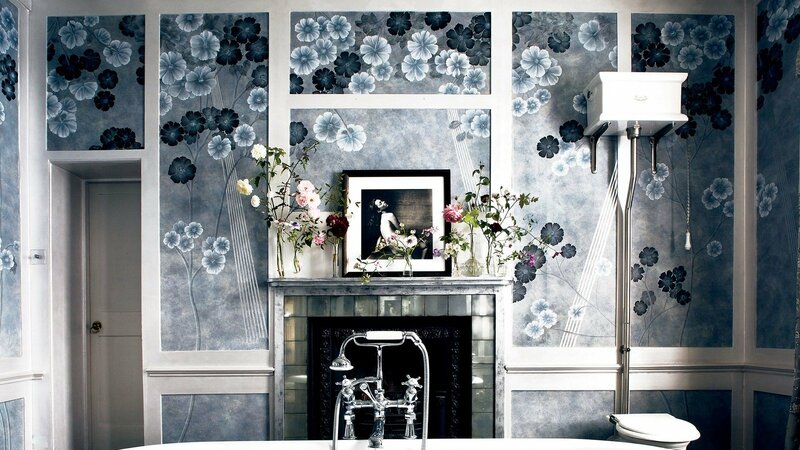 To create a mood of twilight, Moss turned to the company de Gournay, which produces custom wallpaper. 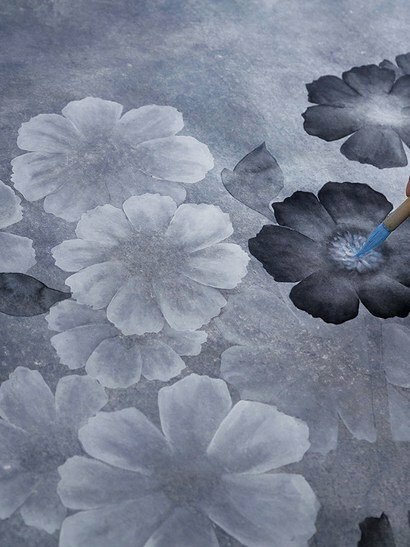 So there was a pattern in anemones of silver shades, which will even become part of the company's permanent collection. 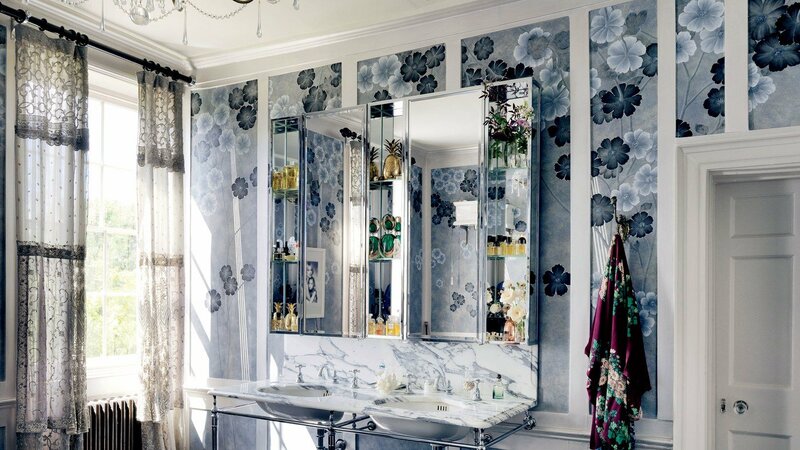 "I've always liked what they do, it's like vintage jewelry - it's special," she notes and adds that for her toilet room she chose wallpaper with a picture of birds that resemble their singing in the garden. The bathroom is complemented by a crystal chandelier by James Worrall, a carved fireplace, a mirrored dressing table, and a wall of black and white photographs depicting Elvis Presley, Elizabeth Taylor, David Bowie and Kate Moss with her deceased friend, designer Alexander McQueen. "I like these old films with glamorous bathrooms that have deckchairs. There is a long soft sofa in my bathroom, and when I have birthdays we always hang out on it," Moss explains. "There's also a turntable, it's snug, Fun - there are drugs, lotions and smelling things. For the bathroom in her village house, Moss developed a day version of Anemone's wallpaper in the light. "I like the feeling when the sun just rises, and there is such a radiant light," she says. "This version is made in pastels and neon is quite psychedelic."